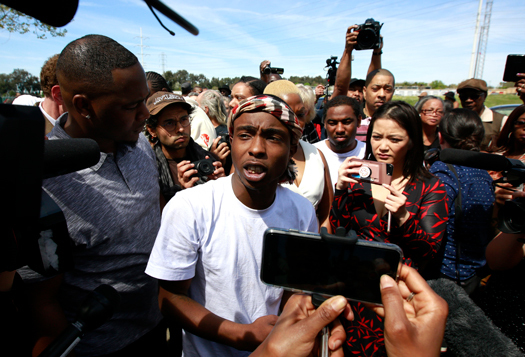 Stevante Clark, the brother of police shooting victim, Stephon Clark, talks to the media after his brother's funeral, March 29, in Sacramento, Calif. Stephon Clark, who was unarmed, was shot and killed by Sacramento police officers, March 18. Stephon Clark’s family is struggling to cope amid threats received by his grandmother, Sequita Thompson, and as his family has called for a federal investigation and increased numbers of Black officers in the city of Sacramento, California. “Grandma got a letter to the house that was saying some negative things about Stephon, and said that she felt threatened,” family attorney Benjamin Crump told The Final Call in a telephone interview April 6. “She received a hate threat, ‘Ya’ll need to shut up. Ya’ll know he was this. Ya’ll know he was that,’ ” the attorney stated. These threats aren’t taken lightly and the letter was sent to the FBI, he said. 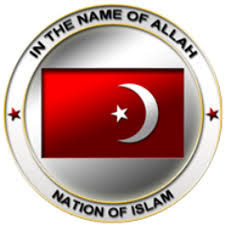 The Fruit of Islam, men of the Nation of Islam, have been securing the family, said Atty. Crump. Stephon Clark was shot to death in March by Sacramento police officers reportedly responding to a call of car vandalism. Two officers, one Black and the other White, shot the young father of two to death in his grandmother’s backyard. The police version of what happened has changed. Initially the story was Stephon had a bar of some kind in his hand and then the story was police thought he had a gun. Only a cell phone was found at the scene of his death from multiple gunshot wounds. Police officers also turn off the audio of their body cameras at one point following the shooting. Ms. Thompson expressed gratitude for the protection and outpouring of love her family has received. “Prayer,” she said, “and also they came over to make sure our family has eaten and they have just done so much for us to help support us.” She cannot drive, but she has been driven to handle errands and doctor’s visits. She also wants everyone to know there is a demand for justice in her grandson’s death. “This needs to turn around! It needs to turn around for not just us, but for all the mothers and grandmothers and fathers, everyone who has been going through this, officers doing this,” said the grandmother. “They (police) need more training, for one thing. And they’re just not out to kill! You just don’t shoot no one,” Ms. Thompson lamented. 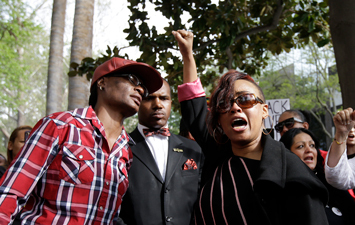 Jamilia Land, right, the aunt of Stephon Clark who was shot and killed by Sacramento police officers two weeks earlier, calls for the indictment of the officers during a rally outside the office of Sacramento District Attorney Anne Marie Schubert, April 4, in Sacramento, Calif.
Stevante Clark, Stephon’s brother, admitted to having a difficult time but told The Final Call, he is holding up. He shared a list of things desired by his family: First, they no longer want the video of his brother’s shooting aired on national television. 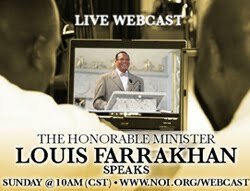 “We do not want to see nor hear the gunshots or anything concerning the video. We’ve seen it. We’ve heard it … my family is sick of it,” Stevante Clark said. They want at least a 15 minute sit-down with Sacramento Mayor Darrell Steinberg and Police Chief Daniel Hahn about programs, an activity center in his brother’s name and changes in police hiring practices. He wants Mayor Steinberg to outline a program on paper for hiring of more Black police officers. “Even though there was an African American officer involved in my brother’s death, 99.9 percent of the time, it’s White men killing Black men in police genocide cases,” argued Stevante Clark. 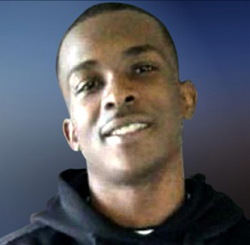 Community building in Stephon Clark’s name? His family wants afterschool job programs for Black youth and financial resources to help youth obtain skills, stay out of trouble, and not be driven to commit crime. “We need the mayor to put pressure on the state to bring industrial building and trade programming back in the school. 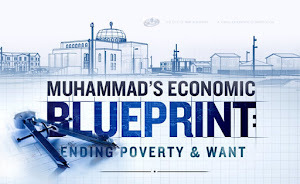 Jesus was a carpenter,” Stevante Clark noted. Most of all, he wants pressure to reform Sacramento city jails. “It’s a f----g office building. ... It looks like Wells Fargo Bank. ... They’re stocking people up there like flies,” said Stevante Clark. “We also want the Muslim community, Christian community, local activists, family and the young gang members in the community to get together and discuss initiatives on Stephon’s legacy and how we can better improve our community and Black people as a whole,” he added. Stevante Clark told The Final Call he has heard nothing from faith-based groups, community leaders, and politicians, despite promises to help build a resource center and library in his brother’s name. “I keep hearing people talking about it, but they’re not reaching out. ... The marching and everything is cool. I love the marching. That’s part of our history, and our roots, and our culture as who we are, but we need to start doing the community building. We need action involved,” Stevante Clark stated. Stephon’s grandmother was pleased with Sacramento Kings NBA players’ involvement with grassroots organizations and their call for justice for Stephon. On March 30, players Vince Carter, Garrett Temple and Kings legend Doug Christie participated in a dialogue, “Kings and Queens Rise: A Youth Voice Forum for Healing” at the South Sacramento Christian Church. The Kings and Black Lives Matter hosted the forum with the Build. Black. Coalition, which works to help transform Sacramento communities by investing in Black youth. The Kings have promised to create an education fund for the children of Stephon Clark as part of their commitment to the goals of the Build. Black. Coalition. 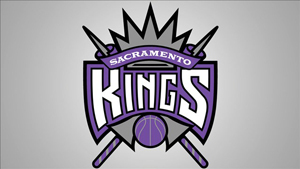 “This fund cannot fix the issues that led to the death of their father, but it will secure opportunities for their futures while the family and the city grapple with healing,” the Sacramento Kings said in a statement. “A lot of people need to see how this has affected, not just us, but a lot of people. A lot of people have not been mentioned, and the Kings have now got this out that they are supporting us. They’re supporting other family members too, that this has happened to them, so I am so happy,” said Ms. Thompson. Atty. Crump is doing the best he can on the legal front for justice, but community work is needed and Sacramento must get its act together to be a model for the world, said Stevante Clark. During an April 5 town hall meeting at Unity of Sacramento Church, Ms. Thompson was comforted by Democratic Senator Kamala Harris. 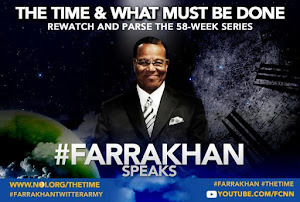 “God has the last say so and I feel that, it might not be this year or next year, it’s gonna be that we’ll get justice. 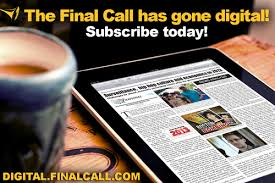 We’ll get justice,” Ms. Thompson told The Final Call in an exclusive phone interview with Atty. Crump shortly after the meeting. 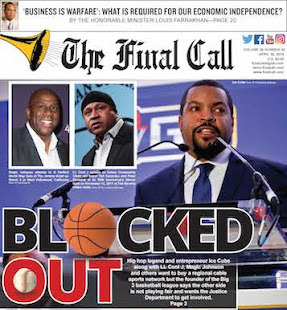 The Final Call’s request for an interview with Sen. Harris was unanswered at press time. 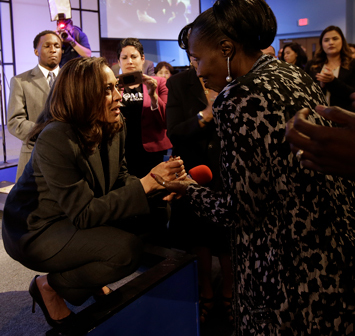 U.S. Sen. Kamala Harris, D-Calif., left, talks with Sequita Thompson, the grandmother of Stephon Clark, who was shot and killed by Sacramento police, during a town hall meeting April 5, in Sacramento, Calif. Harris spoke about the shooting on March 18, where two officers chased Clark, an unarmed Black man who was suspected of breaking into cars, into his grandparents' backyard and opened fire. Sen. Harris addressed the fatal shooting head on during the town hall, saying it is a priority and there’s no question Stephon Clark’s life should not have been lost or ended. “I spoke with his grandmother, and when I think about the work of his family members and friends in this community, in the face of personal and deep grief, being a voice of leadership around an issue that remains a national issue, and doing that work of being those courageous voices and selfless in that way, my heart breaks for what has happened,” said Sen. Harris, who served as California’s attorney general for eight years before winning her seat in Congress in 2016. The Clark case highlights problems that have been challenging the U.S. for decades, said Sen. Harris. During her tenure as state attorney general, and after years of dealing with shootings similar to Stephon Clark’s, California created its first Implicit Bias Procedural Justice Training for Law Enforcement. To date, over 2,000 police officers have been trained to recognize all persons carry bias, she stated. “We all do, but your bias is coupled with the fact that you carry a gun; it is something that has to be a priority for us. It should be a priority for all of us anyway, but we have been doing that training, understanding that it’s the best practice, and then this happens,” Sen. Harris said. 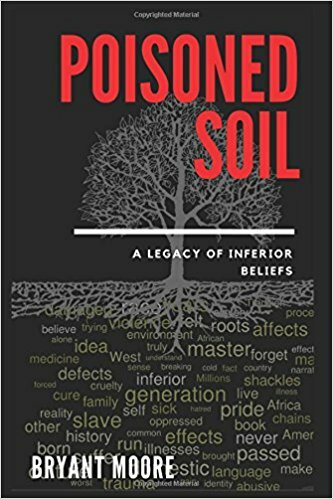 Ms. Thompson, Stephon’s grandmother, told The Final Call she was devastated by the independent autopsy conducted by Dr. Bennet Omalu, a forensic pathologist, which contradicted police claims her grandson was facing them. Dr. Omalu said evidence showed Stephon Clark was shot in the back, in the neck, on his left side near his back, and in the right back and shoulder, and thigh as he fell or hit the ground. He was unarmed. Black Lives Matter Sacramento, the Anti-Police Terror Project & the Justice Network held a national day of action April 4, the 50th anniversary of the assassination of Dr. Martin Luther King, Jr. They protested at Sacramento District Attorney Anne Marie Schubert’s office, and demanded answers and justice for the police killing of Stephon Clark. They accused Sacramento district attorney Schubert of foul play after news broke that she received political contributions from police organizations days after officers gunned down 22-year-old Muslim on March 18. According to the County Election’s Office, Ms. Schubert received $10,000 from the California Statewide Law Enforcement Association on March 20, then later that week, $3,000 from the Sacramento County Alliance of Law Enforcement, reported CBS Sacramento Channel 13. She is running for reelection. The Final Call reached out to Ms. Schubert’s office for a statement, but she was not available at the time, a spokesperson said. “We have to review her record and hold her accountable if she doesn’t administer justice for Stephon Clark and our community,” commented Atty. Crump. According to Vance Chandler, spokesperson for the Sacramento Police Department, the department has not been provided with the official report from the Sacramento County Coroner’s office. He said the Sacramento County Coroner’s Office conducts an independent death investigation separate from a joint investigation conducted by the Sacramento Police Department and the California Department of Justice. Further comment prior to the release of the coroner’s report along with the official review by the Sacramento County District Attorney and the California Department of Justice would be inappropriate, said the police department spokesman. “We acknowledge the importance of this case to all in our community and we are committed to a thorough and comprehensive investigation,” Mr. Chandler told The Final Call in an email.